Thomas/Boyd Communications (TBC) was hired by the Monmouth County Board of Chosen Freeholders to provide strategic counsel and tactical assistance for public relations and communications initiatives. Our assignment was to develop programs and messages that would enable the county to communicate more effectively and efficiently with its constituents. We provide strategic guidance on a variety of issues, develop programs and tactics, create content and postings for social media, and write content for many purposes. 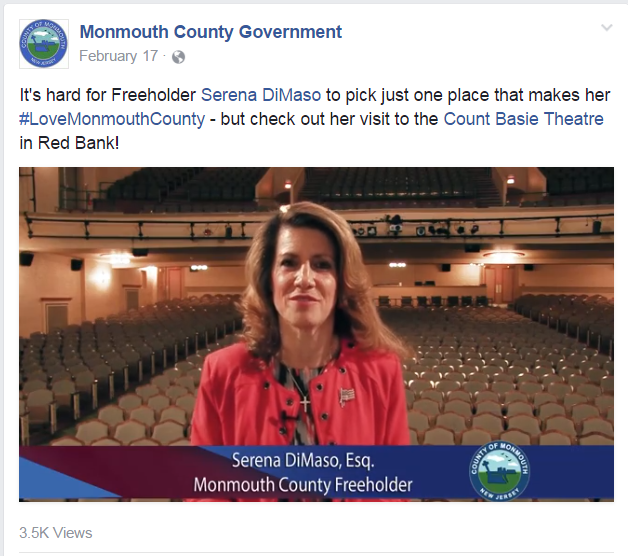 TBC conceived and executed several successful social media video and photo campaigns with Monmouth County, including a Veterans Video campaign in November 2016 and a #LoveMonmouthCounty tourism campaign throughout 2017. TBC worked with Freeholder aides and Public Information Office team members to coordinate video recordings of Freeholders and veterans for social media. In addition to increasing follower engagement, TBC has guided Monmouth County to a 93.6% increase in Facebook page “likes” within weeks using paid page advertising and creating interactive, shareable posts.